Every 4 ½ minutes, a baby is born with a birth defect. Some birth defects are mild-like an extra finger or toe. Some birth defects are very serious-like a heart defect. Birth defects can cause physical, mental, or medical problems. Down syndrome is caused by genetic factors, while others are caused by certain drugs, medicines, or chemicals. But the causes of most birth defects are unknown and researchers are working hard to learn the causes of birth defects so we can find ways to prevent them. The good news is that new ways of preventing and treating birth defects are being identified. Genes that may cause birth defects are being found everyday, providing hope for new treatments and cures. Genetic counseling provides parents with information about their risk based on family history, age, ethnic or racial background, or other factors. Better healthcare for mothers with diabetes or seizures can improve their chances of having healthy babies. Today, babies born with birth defects can live longer and healthier lives. 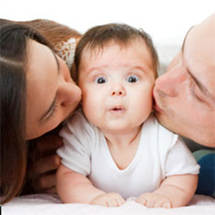 Special care after birth and newborn screening tests can help these babies. Take 400 mcg of folic acid every day, starting at least one month before getting pregnant. Don't drink alcohol, smoke, or use "street" drugs. Talk to a health care provider about taking any medications, including prescription and over-the-counter medications and dietary or herbal supplements. Also talk to a doctor before stopping any medications that are needed to treat health conditions. Learn how to prevent infections during pregnancy. If possible, be sure any medical conditions are under control, before becoming pregnant. Some conditions that increase the risk for birth defects include diabetes and obesity. If you are pregnant or planning to get pregnant, see your healthcare provider. Prenatal care, which is health care received during pregnancy, can help find some problems early in pregnancy so that they can be monitored or treated before birth. Birth defects occur before a baby is born. Most birth defects occur in the first 3 months of pregnancy, when the organs of the baby are forming. This is a very important stage of development. However, some birth defects occur later in pregnancy. During the last six months of pregnancy, the tissues and organs continue to grow and develop. Most birth defects are thought to be caused by a complex mix of factors. These factors include our genes, our behaviors, and things in the environment. For some birth defects, we know the cause. But for most, we don't. Women who take certain drugs, smoke, or drink alcohol during pregnancy. Women with certain medical conditions, such as uncontrolled diabetes or obesity before and during pregnancy. Women who take certain medications that are known to cause birth defects, such as isotretinoin (a drug used to treat severe acne). Women who have someone in their family with a birth defect. To learn more about your risk of having a baby with a birth defect, you can talk with your healthcare provider. Women over the age of 35 years. If your child has a birth defect, you should ask his or her doctor about local resources and treatment. Geneticists, genetic counselors, and other specialists are another resource. More Information can be found here. Information presented does not constitute medical diagnosis or health care advice. Please see a healthcare professional for individual information.